Cut off tough end of each Asparagus spear, usually about 1 to 2 inches up from the bottom of the stalk. 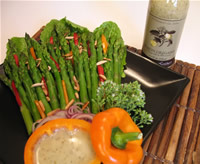 Place asparagus spears into boiling water and cook for 3 to 6 minutes, depending on the thickness of the asparagus. They're done when they're tender but still have a bit of a snap to them. Take out of water and plunge into an ice bath until cooled. This will stop the cooking process and keep them crisp. Take out of ice bath and dry them on paper towel. Garnish with leftover strips of peppers, and top with toasted almond slices. Take whole yellow pepper and cut top off, remove all seeds, place on platter and fill with Gunther's Lemon Oregano Vinaigrette. 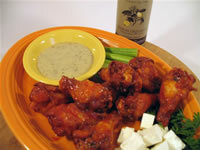 This is a simple twist on Buffalo Wings. In a 375 degree deep fryer, fry wings and drumettes for 8 to 12 minute (depending on size) or until golden brown and cooked through to the bone. Place in bowl and toss with your favorite hot sauce. The twist here is, instead of ranch or blue cheese dressings, use chilled Gunther's Gourmet Lemon Oregano as a dipping sauce and garnish with feta cheese and celery sticks. Marinate trimmed and flattened chicken breast in Gunther. Remove from marinade and let excess marinade drip off. Lightly dust chicken breast in bread crumbs until evenly and well coated. In a large saute pan, one which can hold all 4 chicken breasts without them touching, heat olive oil over high heat. Place chicken breast in hot oil, skin side down, and saute til golden brown, about 3 to 5 minutes. Turn over and repeat. 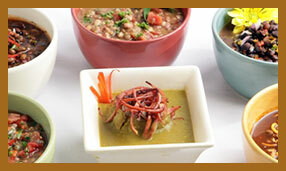 *Always turn the product you are frying away from you so if there is a splash of oil, it splashes away from you. 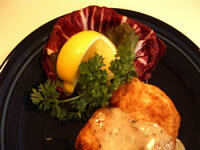 Cook until the chicken breast is golden brown and firm and springs back when touched. If the chicken breast is a nice golden brown but still soft to the touch, remove from pan, place on a cooking sheet and put in a preheated 375 degree oven for 3 to 6 minutes. This finishes cooking the center without burning the outside. This also helps get rid of some of the oil in which you fried the chicken. When cooked through, remove from oven and let set for 3 to 5 minutes. Preheat oven to 400 degrees and place rack on middle setting. While the oven is heating, coat top of pizza crust or pita bread with Gunther's Gourmet Lemon Oregano Marinade. 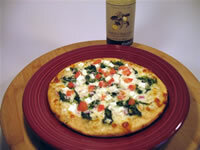 Top with mozzarella cheese, spinach, red onion, feta cheese and tomatoes. Place the pizza directly on the middle oven rack and cook for 10 to 14 minutes or until the pizza is golden brown and the cheese is bubbly. Soak 4 wooden skewers in water for about one hour, preheat the oven to 375 degrees. On each skewer alternate the pork cubes, green pepper quarters, yellow onion quarters and cherry tomatoes. Place kabobs in a zip lock baggie and marinate with Gunther's Lemon Oregano Marinade for at least 1 hour. Place kabobs on a cooking rack over a sheet tray and put in the oven, bake for 10 to 12 minutes and rotate. Bake for 10 to 12 minutes more or until pork is cooked through. Place halved tomatoes in a mixing bowl. 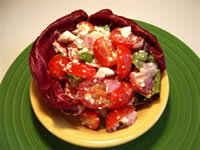 Gently toss with feta cheese, red onions and Gunther. Season with fresh ground black pepper. Add Kosher salt if needed - *Note: Feta Cheese should contain enough sodium to satisfy the need for salt. Refrigerate for a minimum of 2 hours in a plastic storage container, as the acid from the tomatoes and marinade will react adversely with an aluminum bowl and impart a metallic flavor to the dish. Mix in romaine lettuce just before serving, serve chilled as an appetizer salad or as a side dish with your favorite Mediterranean entree. *Note - this salad is best when made a day in advance.